Shares of enterprise software concern Novell (NOVL) are trading up sharply after hours, after multi-strategy Elliott International put out an offer to acquire the entire company for $5.75 per share. Elliott will now reap an instant windfall from the shares they've recently purchased between 4.30 and 4.75 in recent months. It will be interesting to see what happens here. Elliott International has been a shareholder for literally days, something that won't exactly win them favor with management. The letter they shared today does not cite a commitment to finance this deal, and they are quite clear about this being a very "casual" buyout offer. I'm left to wonder if they're actually serious about buying the company, or if they simply amassed a big stake and then launched this campaign to draw attention to management's under-utilization of this company's profit potential. The best outcome for Elliott - in my view - is interest from other parties or a big new cost-cutting commitment from management. Here's Elliott's letter. It's rather cute that Elliott refers to the buyout's premium compared to "the last trading day before we commenced buying Novell's common stock," which of course is of absolutely no concern to anyone but Elliott International. I write to you on behalf of Elliott Associates, L.P. and Elliott International, L.P., which collectively own, or have an interest economically equivalent to, 8.5% of the common stock of Novell and are currently one of the Company's largest stockholders. Elliott is a multi-strategy investment firm with over $16 billion in assets under management focused on employing detailed research to address complex investment situations. Based on our detailed review of the Company's publicly available information and our substantial knowledge of the software industry, we are pleased to submit this proposal to acquire all of the shares of common stock of Novell for a cash price of $5.75 per share. This price represents a premium of 49% over the Company's current enterprise value and 77% over the Company's 90-day volume-weighted average enterprise value. 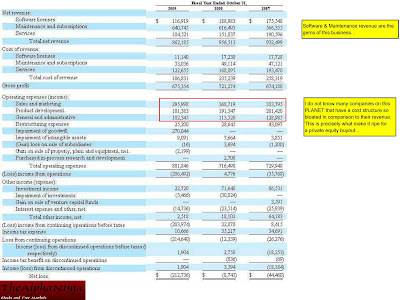 As the Company's cash balance of nearly $1.0 billion represents almost 60% of its current market capitalization, we believe that a premium to enterprise value represents the most meaningful measure of the value that our proposal offers stockholders, valuing the Company's cash at 100 cents on the dollar despite the fact that a significant portion of that cash is overseas and may not be realized in a tax efficient manner. Importantly, this price represents a premium of 115% over the Company's enterprise value on January 4, 2010, the last trading day before we commenced actively acquiring Novell's common stock This price also represents a 37% premium to Novell's closing stock price on January 4, 2010 and a 20% premium to Novell's closing stock price yesterday. By any measure, we believe our proposal represents a compelling opportunity that your stockholders will find extremely attractive. Novell is a long-established company that we have followed closely for a considerable period of time. Over the past several years, the Company has attempted to diversify away from its legacy division with a series of acquisitions and changes in strategic focus that have largely been unsuccessful. As a result, we believe the Company's stock has meaningfully underperformed all relevant indices and peers. With over 33 years of experience in investing in public and private companies and an extensive track record of successfully structuring and executing acquisitions in the technology space, we believe that Elliott is uniquely situated to deliver maximum value to the Company's stockholders on an expedited basis.